"What is your favorite destination?" When I couldn't name just one, I knew that I had found my calling - sharing the world with others. I've been organizing and planning getaways for clients since 1999. My career in travel started with an internship at Kahala Travel in San Diego, which turned into a full-time position immediately after graduating from Point Loma Nazarene University. I took my love of travel one step further in 2013 when I decided to start my own travel consulting business - For Love of Travel. My passion is for working with leisure travelers. From girlfriends' getaways to St. Lucia to 7-month around the world adventures covering five continents, I have extensive experience in crafting custom itineraries suited to my clients' interests, desires, and budgets. With all the information that is available online, I've found that my job is more important now than ever as I help my clients wade through the endless choices available and hone-on on their ideal getaway. I look forward to sharing my expertise with you to create a an incredible travel experience so that you, too, will experience the love of travel! 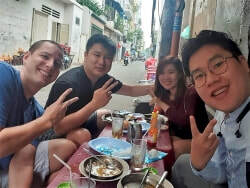 Enjoying some breakfast with friends at a street-side restaurant. I became interested in east Asian cultures as a teenager, so I joined the Air Force as soon as I graduated high school to travel the world. I was disappointed to find out I would be spending my entire enlistment stateside. After college, I spent over a year in Vietnam teaching English. I fell in love with the country, and now it is my personal mission to experience as much of eastern Asia as possible, and to share my love for the region with the rest of the world. 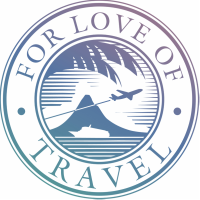 ​I am so happy to be part of a team of knowledgeable and experienced travel consultants at For Love of Travel.